…on what I want to do now, like eat a piece of chocolate, read a good book, or wander around the internet. Procrastination is the gap between intention and action: a voluntary, irrational, delay despite the expectation of a potential negative outcome. Usually we procrastinate on important tasks which move us toward our goals and improve our relationships. Procrastination costs too much in many ways. It wastes the most time and creates the most stress. It causes us anything from mild discomfort to lost opportunities and grinding worry. It undermines our performance and disturbs our well-being. It often leaves us feeling guilty and frustrated. According to Timothy Pychyl, Ph.D., Associate Professor of Psychology at Carlton University, Ottawa, who has been researching procrastination since 1995, everyone procrastinates, but some of us definitely do it more than others. In my case, for many years I believed that “I work better under pressure.” I believed this because, in my 20’s and 30’s, I was often able to rush at the last minute and still do a credible job – at least in my own eyes. But according to Pychyl’s research, procrastination results in less time to do a thorough job, so my performance was probably not as good as it could have been. But a bigger problem arises out of believing you work better under pressure. You will inevitably get promoted to a position where you cannot get away with last minute scrambles. You are at your level of incompetence. At that point, you will have a lifetime habit you need to change quickly. This requires clear understanding and persistent effort. It is bad enough that procrastination may be negatively affecting your performance at work, but what if it is also affecting your relationships with your spouse, your children, and other people you care about? What are the things you intended to do for someone else, but just didn’t do? The stress of procrastinating and then trying to get too much done in too little time is bad enough, but some of us procrastinate in taking care of our health. We procrastinate on exercising regularly, shopping for and eating the right foods, and getting to bed on time. When you are on the hospital gurney, it is too late to wish you had developed healthy habits. DO start sooner than you think you need to. DO turn off all social media and email alerts. DON’T fall into “This will only take a minute” trap. DO block off time and space early in your day. DO protect your willpower. See Strengthen your Willpower on my blog. DO know you will “be in the mood” to do the work once you are well started. DO the best you can with the time and energy you have now. If you get interrupted, ask, “Does this have to be done right now?” See Kelly Swanson’s article. DO try focus@will for music to help you concentrate. DO specify the what, the when, the where, and the how you will accomplish the task. DO forgive yourself for lost opportunities due to your procrastination. DO be kind to yourself; expect two steps forward and one step back as you reduce your procrastination. For additional inspiration, please check Tim Pychyl’s Procrastination Research Group Home page. Enjoy the video and the other tips. My goal is to help you boost your brain power and be happy and productive at home and at work. 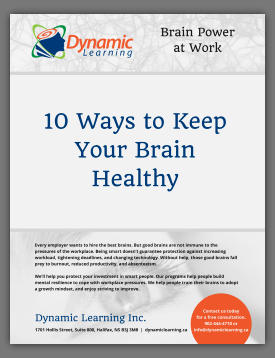 Each month you will learn about changes in thinking that can help your productivity and your brain health. Please share this information with your friends and colleagues. I really appreciate your feedback and suggestions. Contact me to talk about how I can help you or your management team get the most value out of your intelligence and experience. Call me at 902-444-4710 or 866-317-9837 or email me.